Ellie Tiglao (center) speaks with guests during a meal at Tanám. Where to: Tanám, a pop-up-turned-restaurant featuring Filipino cuisine in Somerville’s Bow Market. Why: In America’s embrace of cuisines from all over Asia, Filipino food has often been overlooked. Yet more than 3.5 million Filipinos live in the United States, making it the second-largest Asian population (Chinese is the first). Now, with critically recognized Filipino restaurants like Bad Saint in D.C. and Lasa in Los Angeles on the scene, there is increasing interest in this food that has been influenced by Chinese traders, Mexican settlers, and Spanish and American colonization, but that is all its own. Until recently, the only Boston-area place to get Filipino food has been JnJ Turo-Turo in Quincy. Tanám makes one more. Cofounder Ellie Tiglao calls its multicourse, ticket-only meals “narrative cuisine”: They aim to tell a story about Filipino food, culture, and identity. The Back Story: Tiglao came to Boston from California for a career in neuroscience. Food beckoned instead, and she began hosting a pop-up series called Pamangan. 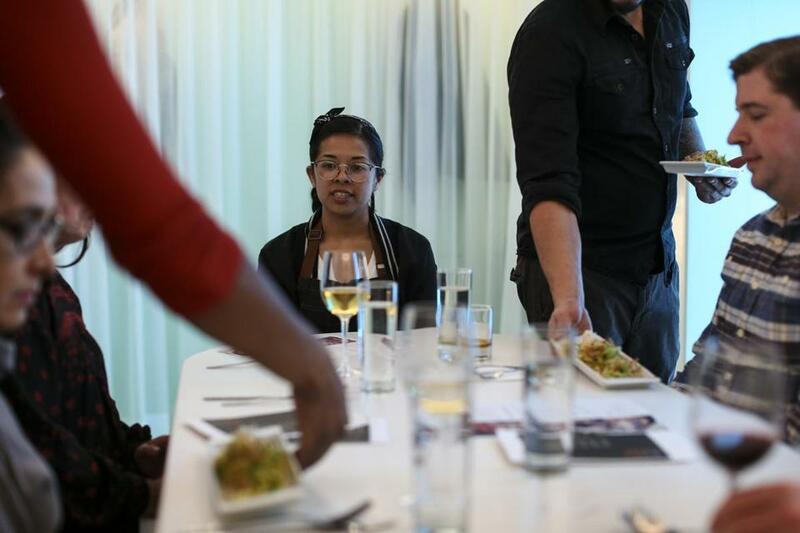 She is also part of Olio Culinary Collective, a worker-owned business largely run by women of color. Olio and Pamangan came together to start Tanám, which incorporates Olio’s dedication to fair labor practices and sustainable sourcing. The restaurant’s small space — it has just 10 seats — is designed to be intimate and encourage interaction among guests and staff. You will get to know your tablemates; Tiglao and company come out to chat and answer questions. What to Eat: Tanám offers several different experiences. Chibog, Tagalog slang for “mealtime,” comprises five courses ($90 per person). Kamayan, on Wednesdays, is a family-style dinner with a ton of dishes served at once ($70 per person). No plates or silverware: It’s served on banana leaves, and you eat with your hands. And you can come for late-night drinks and snacks. A recent Chibog menu featured a run of beautifully plated, intricately flavored dishes, replete with sourness and funk: sugba kilaw, grilled pork belly and mackerel with mango, ginger, coconut vinegar, and cherry-smoked coconut milk; a salad of crab, ginger-turmeric dressing, shaved Brussels sprouts in fish-sauce vinaigrette, lychee, and fried shallots; a take on the beloved dish kare-kare that featured vertically stacked oxtail, vegetables, peanut sauce, crisped rice, and shrimp paste. When it was time to go, Tiglao handed each guest a box to take home. Inside, all the fixings and a recipe to make the noodle dish pancit at home. What to Drink: There’s water flavored with pandan leaf, fun cocktails, and carefully chosen wine pairings. The Takeaway: Tanám is a deeply personal and delicious foray into Filipino food, with a social conscience. It brings people together in more ways than one. Devra First can be reached at devra.first@globe.com. Follow her on Twitter @devrafirst.